Manufactured in house to the highest quality standards using T45 these front sub frame conversions shed 5 kilos of weight from the front of your car. These are designed to use all the existing suspension pick-up point for installation. Simply bolt in. These are supplied in bare metal finish so that you can inspect the welding. This package saves weight and allows more flexibility in set up for different surfaces/disciplines. 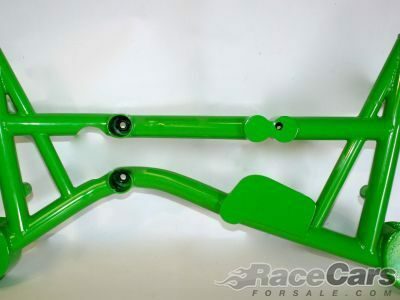 We also make the tubular lower suspension arms that can be seen in some of the pictures. These do not come with the sub-frame but can be supplied at extra cost. You will find these lower arms and comprehensive pictures listed in our EBAY shop. If you have any enquiries please dont hesitate to call us on 02892 621822. Our shop is open from Monday to Friday, 8am to 5pm and are happy to answer any questions or help with any technical queries. We have tested these units in a variety of motorsport applications and found no weak points, although we are selling this item for competition use only. Sport prototype 2001 year , new engine with 200 km motor Nissan V6 3.5 480 HP gearbox hewlan - H chassis tame peske suspension and breaks AP Racing. UNIQUE IN THE WORLD !!!! More infos please phone !